Denver CO (Nov 2)--Colorado Inmate 182605 Deborah Ellen Frisch was transferred to teh Denver Women's Correctional Facility yesterday, according to teh Colorado DOC website. Whether DWCF will remain Debbie's lodging for teh duration of her incarceration is (as yet) unknown. 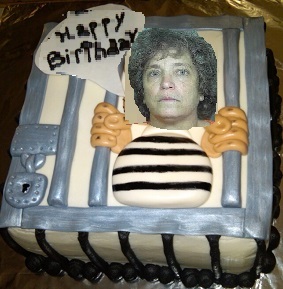 Miss Debbie's move occurred just in time for felon Frisch's 57 birthday--a day often celebrated by Debbie with criminal behavior and consequences. According to teh PrisonPro website: "Denver Women's Correctional Facility...can house about 975 female inmates. Offenders who are incarcerated here and are going to be released soon may participate in the reentry and integration program, which helps inmates transition back to society." Our recommendation: The only steps which will help teh Deb "transition back to society" will no doubt involve 1) her mouth being surgically sealed and 2) a permanent ban from Internet use.